Back to school! Back to Healthy Meal Prepping! Like adults, it's crucial for kids to get the right nutrients! From the minute they wake up they are extremely active, so we need to feed them with the right fiber, fats, and nutrients. A rule of thumb is: Offer your kids at least 1 - 2 serving of berries/fruit each day, 2 - 4 servings of vegetables, a good quality whole grain bread, try to avoid wheat though. Use a good quality meat mostly from free-range or grass-fed animals, and eliminate or at least limit soft drinks, all kinds! Remember if you don't introduce it to your kids, they don't get the craving! Most importantly, eat most meals together as a family. I usually don't recommend milk, but if you have to, use grass-fed full fat. Basically, dairy milk is for calves only! Best thing is to use plant-based milk instead. Did you know that more than 12 million children in the US are obese? That’s one out of 6! Read the article here. Junk food and lack of exercise is the typical cause. These children have an increased risk of developing all the known lifestyle diseases such as diabetes, asthma, high blood pressure, and high cholesterol. The last two are also known risk factors for heart disease. Furthermore, obese children are more likely to be bullied, which increases the risk of depression! Is this really what we want for our kids just because we don’t have time to buy or prepare whole food for them? By eating whole food, and making better choices when you eat out, you’ll get so many benefits. Not only weight wise, but also for the whole family. Your kids will be able to sit still in school and actually learn much more. They will be happier and more active. Let your kids sleep in a dark room, no light at all. Not even from an alarm clock or TV. If they have electrical devices, have them turn it off at least 2 hours before bedtime. Make a check-off chart on the fridge for every family member and have them check off every time they fill their water bottle. Set a goal with everyone on how much they should drink every day. Figure out what type of exercise your kids would love to do, and support them in getting it done every day! When possible, let them bike to school or when they visit a friend. You don’t really do them a favor by driving them all the time! But make sure you teach them traffic safety. In Denmark, we have a day at school every year where everybody brings their bikes. The police are there all day teaching us how to behave in traffic, what hand signals to use, along with checking if our bikes are safely equipped with lights, brakes etc. It’s a fun activity! Most kids ride their bike to school in Denmark if its less than 5 miles. Make sure your kids are outside playing at least 30 minutes every day. If it rains, put on rain gear. If it snows, snow pants, warm jacket, hat, gloves and boots, and in summer, well then you really don’t need much! American children (as well as adults for that matter) are so used to being at 68 to 70 degrees year round, that their bodies cannot adjust to different temperatures. Furthermore, all the air-conditioning weakens your immune system too! So, turn it off, and let your body work the way it is perfectly designed to. Teach them to sit down and relax for 15-20 minutes every day. Either to some soft music or just in total silence. This one I love! Have everyone sit down before bedtime and write down at least 5 things you are grateful for today. Prepare the week, by making batches of fruit and veggies for lunch and snack, so it's easy to grab on the go. Find a great place like LeJuicery where you can get healthy foods and drinks for takeout. That way you provide your kids with whole food instead of junk. 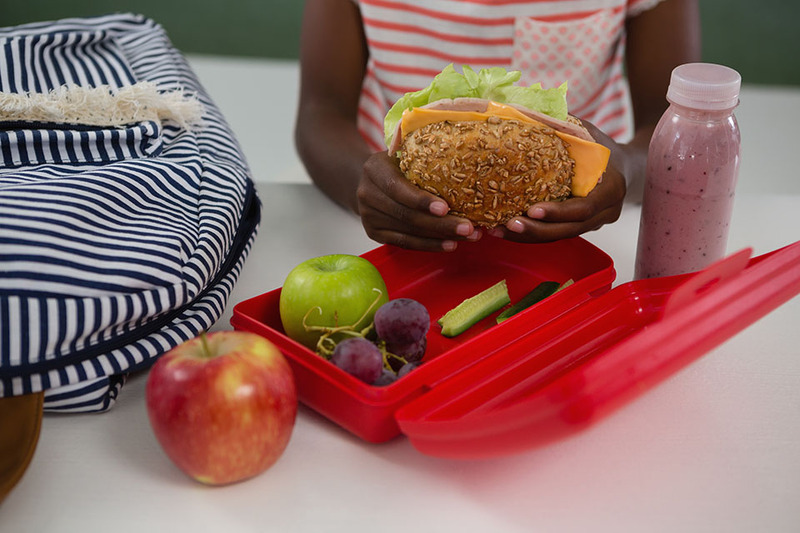 Processed and packaged kids' meals are often high in the wrong fat, calories, sugar, and salt. Chicken kabobs are always a hit among kids, fruit kabobs are also a fun way to help them choose healthy snacks. If you just want it easy, just call us in advance (262) 842-5337 and place your order for a healthy breakfast, we've got you. Check out the menu here. Having a healthy eating plan will help move your kids away from wanting to eat chicken nuggets and french fries at every meal. For water intake, let the kids help flavor their own bottles with the fruit or herbs they like. As you and your kids learn to make healthy choices and begin eating better, you will experience fewer outbursts from the kids, or yourself for that matter! The result is, everything gets a lot easier, and before you know it, making healthy choices will become your new normal.